1 Honey Bunny hung up the phone and turned to her husband. "We just got our first order for a sugar-free Easter basket," she said, laying her polka-dotted pen beside the pink order pad. 2 Bill's brown eyes crinkled at the edges. "That's great! Who is it for?" He added a chocolate rabbit to the yellow basket on the counter. 3 Honey told him that it was for a child who had diabetes. The average Easter basket had lots of sugary treats in it. Diabetic children need to avoid sugar to be healthy. 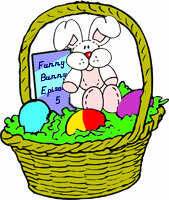 The Bunny Basket Shop could make special sugar-free Easter baskets. 4 "I'll make an extra-special basket," Bill said. "I remember what it was like to feel left out at Easter. All my friends got baskets full of candy. They went on Easter egg hunts and found plastic eggs full of candy. My Easter was just a nice dinner and a sugar-free gelatin for dessert. I always wanted an Easter basket." He tied a green bow to the yellow basket. 5 "Children with diabetes shouldn't miss out on Easter fun," Honey said as she reached for a big white basket on a nearby shelf. "They just need different treats!" 6 The phone rang, and Honey answered it. Soon she was bending over the order pad to write down the caller's order. Her honey blond hair swung across her cheek as she asked for the caller's name and address. 7 Bill reached for a bag of green Easter grass. He put a large amount in the basket. Then he chose a funny video from the shelf behind him. The video went in the middle. He added a coloring book and crayons, a pair of ladybug sunglasses, some stickers, and a set of three bunny pencils. They had drawings of real rabbits on them. 8 Next, Bill added three plastic Easter eggs to the basket. The orange, blue, and purple eggs weren't filled with candy. Instead, they had little toys inside.